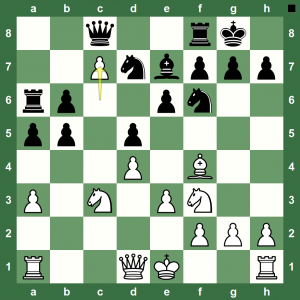 Chess Puzzle Video: What happens after 1.e4 e5 2.Nf3 f6? 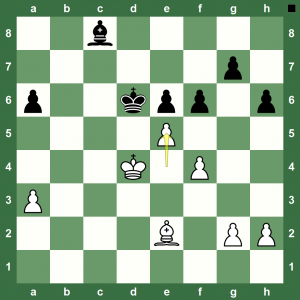 Simple chess – but are you sure about it? What happens after 1.e4 e5 2.Nf3 f6? 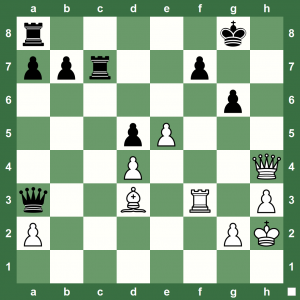 This puzzle is brought to you from our podcast chess database at www.chesskillertips.com. The videos are hosted by 12th Women’s World Chess Champion Chess Queen Alexandra Kosteniuk! 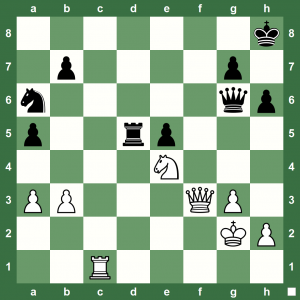 Can you find the best way for White to win this chess endgame? The shortest solution works in five moves! 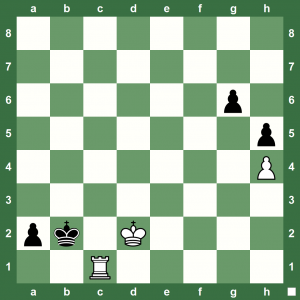 Endgame Chess Puzzle: How does White win? 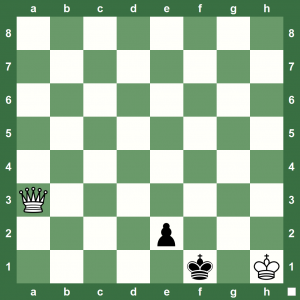 A very interesting chess puzzle for you tonight – There’s going to be a pawn rush in this puzzle for sure. 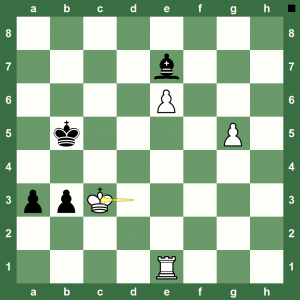 However, the problem is that Black can force a draw if White tries Rg1 0r Rc2! Can you win this for White? 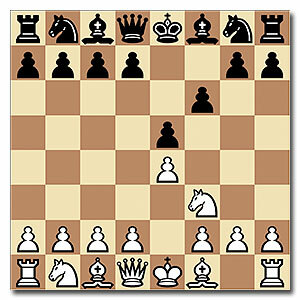 BLACK FRIDAY CHESS DEALS: Save 20% on Chess Assistant 15! CHESS DEAL – There’s a cool 20% discount going on Chess Assistant 15 this whole week, not just in the Black Friday chess sales! 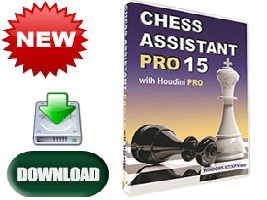 Chess Assistant 15 PRO with Houdini 4 PRO is a unique tool for managing chess games and databases, playing chess through the Internet, analyzing games, or playing chess against the computer. The professional package includes the best playing program – Houdini 4 PRO, Chess Opening Encyclopedia mode, a powerful search system, unique Tree mode, databases of about 6.2 million games in total (November 1, 2014) that can be automatically updated with 3000 new games, ChessOK Aquarium 2015, access to 7-piece Lomonosov Tablebases and more! 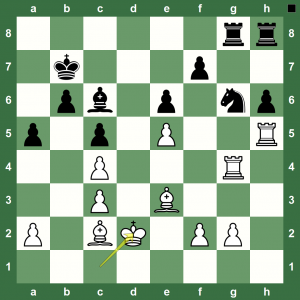 Time for an easy chess puzzle with a cool video solution! From the game Jakob Rosanes vs. Adolf Anderssen, 1863. Black plays and wins. World Chess Champion Magnus Carlsen retains his title with a victory in Game 11. The game was an exciting battle of nerves along with both chess stars playing remarkably accurately. Former World Chess Champion Viswanathan Anand came all ready to fight and it was a bit unfortunate that his brave exchange sacrifice – that had the fans with their heart in their mouths – could not fetch him a win. All credit to Magnus Carlsen who put up a show of accurate and masterly chess calculations. 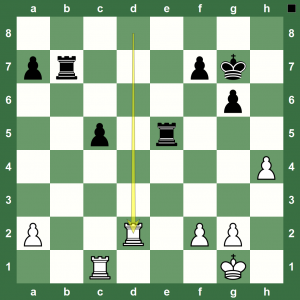 Read a nice report on the round at Chess Blog. You can replay the game with Chess King. A draw in Game 10 only brings Magnus Carlsen closer to retaining the world chess champion title and Viswanathan Anand’s job all that harder. Here is the game 10 that you can replay with Chess King. Could there be a plus for White with the d-pawn pressure? It is something the chess theoreticians will work out soon enough. Both players said at the press conference that the line was interesting and needs to be further checked. Read a report on Chess Blog. Anand did give it try to exert some pressure, but none of the two took any risk. 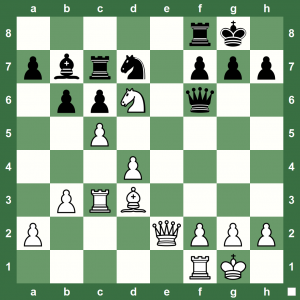 Attacking-Plan Chess Puzzle: How Does White Win? Finding the right attacking plan and combining it with concrete calculations is something Grandmasters do naturally. 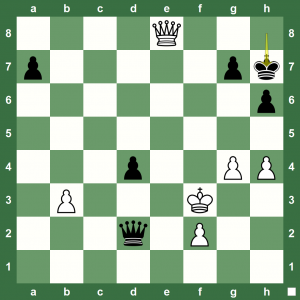 How about testing how good are you at this aspect of chess? White to play and win. World Chess Championship Sochi 2014 Game 9: From coming near to making the world’s longest world championship game, Magnus Carlsen and Viswanathan Anand played out virtually the shortest draw in the match. 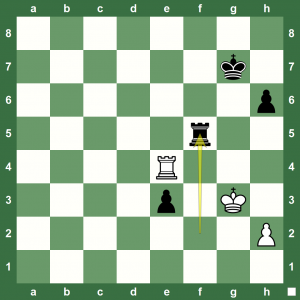 Replay the game with Chess King below and read a nice report at Chess Blog. Game 8 of the World Chess Championship between Magnus Carlsen and Viswanathan Anand finished in a draw in a just over two hours leaving Magnus Carlsen still with a one-point lead. Carlsen tried a new idea, but Anand was ready to shrug off whatever was thrown at him. Carlsen seemed tired and distracted during the game and admitted thus in the press conference. Score Carlsen 4.5 – Anand 3.5. The World Chess Champion played long and hard to to utilize minimal practical chances for a win. However, Anand demonstrated the required accuracy, and the game ended in a draw on the 122nd move, just three moves short from breaking the record for the longest World Championship game. The fifth game of the match between Anatoly Karpov and Victor Korchnoi in Baguio, 1978, ended in a draw in the 124th move. You can read a nice report on Chess Blog. Replay the game with Chess King below. 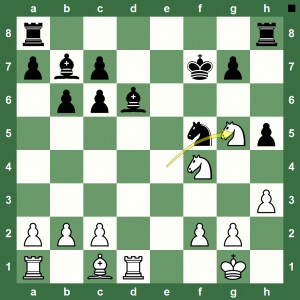 Let’s try a chess puzzle from World Chess Championship Challenger Viswanathan Anand’s second Sasikiran. White to play for a win. It is a simple tactic. Let’s go for a simple chess tactics puzzle from the game Kasparov vs Evgeny Pigusov, Riga, 1977. White to play and win. Former World Chess Champion Viswanathan Anand came prepared for the rare line Magnus Carlsen deployed in Game 5. Carlsen diluted to a drawn a game with plenty of time on his clock, but Anand’s confessions at the post-game press conference possibly meant that he was well-prepared up to move 20.Nd5 at the least. You can read a nice report on Game 5 at Chess Blog. Replay the game below with Chess King. Game 4 at the World Chess Championship 2014 in Sochi, on Wednesday, was an entertaining and exhausting draw. Magnus Carlsen, playing White struggled to eke out a win, but Vishy Anand held on tenaciously. 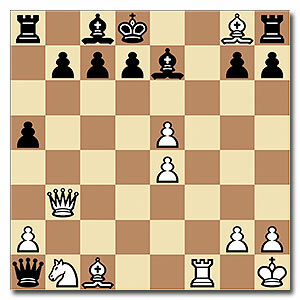 You can read a nice report on Game at Chess Blog. Replay the game below with Chess King. World Chess Championship 2014 in Sochi is already nothing compared to the previous ‘version’ in Chennai though the protagonists are same – Magnus Carlsen and Viswanathan Anand. The Indian Grandmaster delighted chess fans by winning a fantastic, well-planned, scientific Game 3 in Sochi to level the scores 1.5 – 1.5. The excitement is on for sure in Sochi. Replay the game below with Houdini and Chess King. You can read a report on the round at Chess Blog. 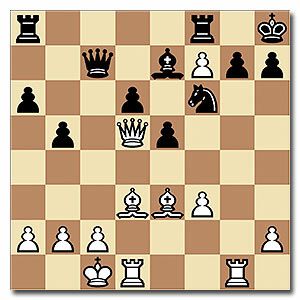 From the game Anand – Van Wely, Monaco 2007. World Chess Championship 2014 Carlsen – Anand Game 2: Reigning World Chess Champion Magnus Carlsen has struck first in the World Chess Championship in Sochi in Game 2. 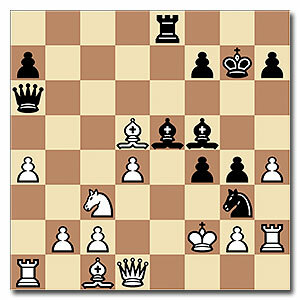 It was a moment of sudden indiscretion as Anand played a blunder with 34. …h5 in time trouble. Actually speaking, this moment of indiscretion was long coming as Magnus Carlsen piled on the pressure and dragged his opponent to the edge of his composure. The Indian Grandmaster cracked. Reply the game below with Chess King. You can read a nice report on the game at Chess Blog.